Breaking out the boots is one of our favorite things to look forward to each winter. There’s something to be said about waking up each day knowing that no matter what the weather brings, a simple jeans and boots combo is all you need (for your lower half, anyway) to leave the house in style and fully prepared. Here are three of our favorite ways to rock our denim atop a pair of winter boots. If you’re going to tuck your jeans into your boots—a great look for trekking around slushy city streets—be sure to opt for a slim-fit jean (shown above). You should be able to grab an inch and a half or less of fabric right below your knee. If the leg is any wider, the ankles won’t stay tucked and you’ll lose the streamlined look. Tucked denim looks best with work boots that end below your calf, like those worn by the model above. Compared with tucking your jeans into your boots, cuffing them creates a more versatile look that will work anywhere, from the office to a first date. You can get away with a looser fit here—but pay attention to material. Stick to a stiffer fabric so the fold stays in place. Opt for work boots or street-friendly hiking boots, like Timberlands or the L.L. Bean boots shown above. Bonus points if you’re cuffing selvedge denim; the signature white and red ID tape is a telltale sign your denim game is strong. “Stacking” your jeans is just fashion speak for scrunching them up. The finished look is effortless, but not sloppy. It’s a stylistic choice that’s more casual than cuffing or tucking, and good for showing off an ankle or mid-calf boot (see above). 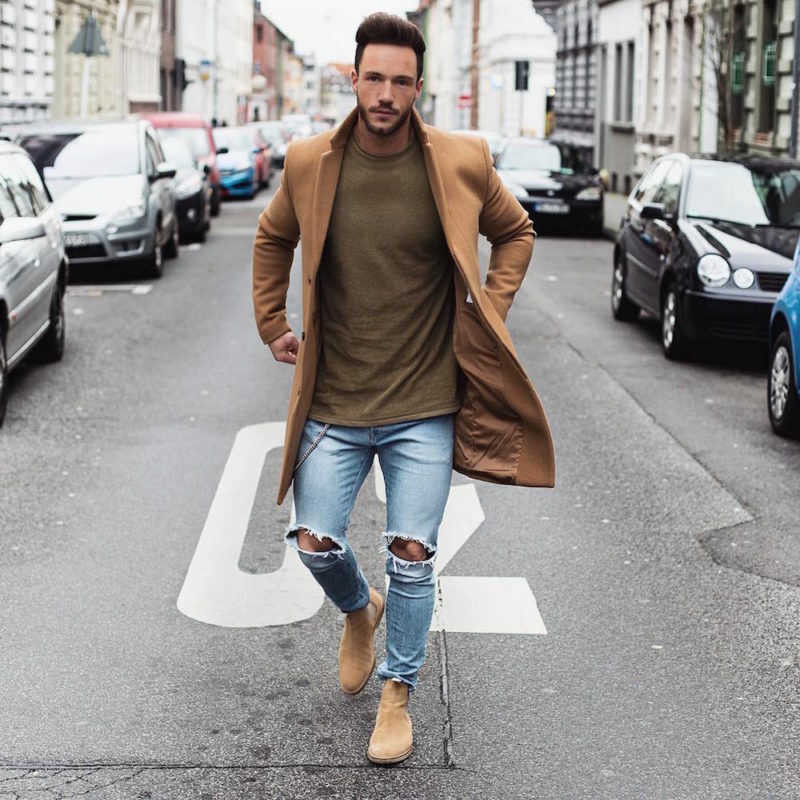 We’re partial to this look with a sand-colored Chelsea boot. Pull the bottom of your pants up so they scrunch around the top of your boot. You can also catch part of the hem in the boot so the jeans stay up. This works best with slim-fit jeans that are narrow around and below the knee, like fashion blogger Leo Chan wears above. If you’re serious about this look, aim for stiffer, 100-percent cotton blends when looking for your next pair of jeans. Looser fabrics won’t hold the scrunch.